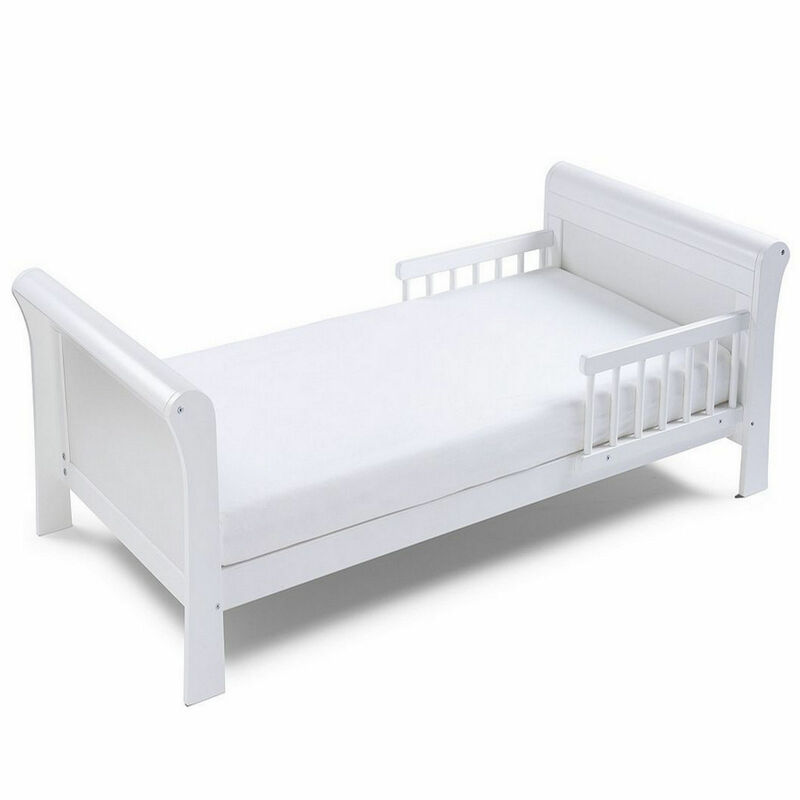 The beautiful 4Baby sleigh junior bed offers a classic style with elegant curved contours. Designed for children who have outgrown their cot, but are not quite ready for a full sized regular single bed frame this would make the perfect addition to your toddlers room. The popular Sleigh bed is low enough to the ground to make it easily accessible for your little one and includes 2 bed rails for additional security offering you that extra piece of mind. Included, comes the Sprung Deluxe cot bed safety mattress. 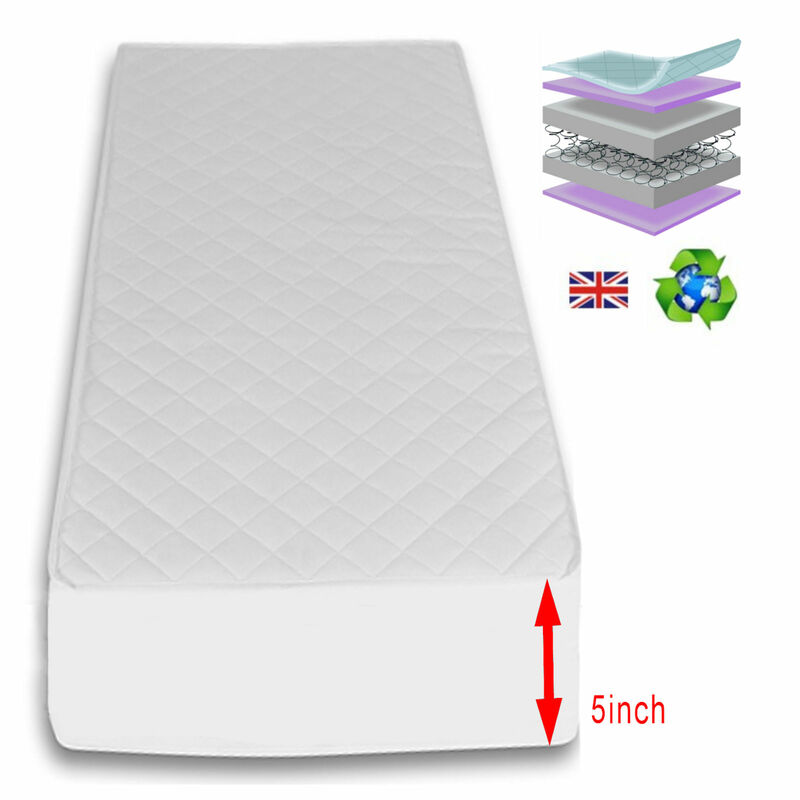 A luxurious 5 inch-thick mattress composed of mini-bonnell spring units encased in an environmentally friendly super-fibre material, helping maintain the shape and prolong the lifespan of the mattress. The hygienic and anti-allergenic cover is breathable and moisture resistant, which can be wiped clean and removed for washing purposes. Air is able to pass through the material of the mattress, helping to reduce perspiration and providing your baby a more comfortable and undisturbed sleep. In addition, the free gliding mattress protector is also included, which is made out of a specialist Corovin® breathable membrane and covers over one third of the mattress (70cm wide x 50cm long). It easily gildes up and down to be positioned in areas which are more vulnerable and susceptible to staining/soiling, thus further prolonging the lifespan of your mattress. Totally itch free and totally recyclable. It is designed from ‘Feet to Foot’ sleeping position. All our mattresses comply with the rigorous requirements of BS 1877 Part 10 for safety and performance , BS 7177 and BSD5852 Part 1:1978.